BluePen Journals holds the ethics of publication as one of its core values and as such, adheres strictly to internationally accepted publication ethics. To ensure compliance, BluePen Journals employs the double-blinded peer-review process for all articles she reviews. The rationale for double-blinded peer review process is to validate the integrity and novelty of the research work. Peer review process adopted by the journal acts as filter and increases the quality of research submitted for publication. This process also help the authors to remove any errors or gaps in manuscript mistakenly overlooked and assists in making the research more applicable in real time. 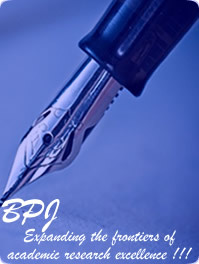 BluePen Journals adopts the COPE guidelines on publication ethics. Editorial Board takes responsibility for making publication decisions for submitted manuscripts based on the reviewer�s evaluation of the manuscript, policies of the journal editorial board and legal restrain acting against plagiarism, libel and copyright infringement.